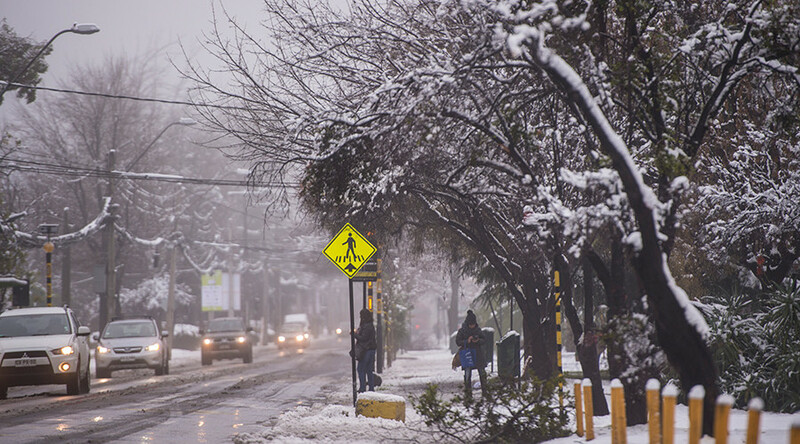 More than 71,000 homes are still without power following the snowstorm that hit Chile's capital earlier this weekend, electric utility company Enel said Sunday. The Las Condes, Vitacura, La Reina, Lo Barnechea, Nunoa and Providencia neighborhoods, all located on the east side of Santiago, are the areas with the largest number of homes without electricity. Some utility customers have been without power for more than 30 hours, Enel said. The snowstorm hit the capital on Saturday, toppling hundreds of trees that fell into power lines, causing outages in different sections of the grid. Utility crews are working to restore power to affected customers, Enel said, adding that more than 300,000 homes were initially left without electricity. Chile's capital was blanketed this weekend by the biggest snowfall in decades, with some residents grumbling about blocked roads and downed power lines, while others made snowmen or tossed snowballs. Tens of thousands of people had their power knocked out in Santiago's metropolitan area with some parts receiving up to 40 centimeters (16 inches) of the white stuff, according to the National Emergency Office. Residents woke up Saturday to find their city covered with snow and by late Sunday thousands of homes still lacked electricity. Andres Rebolledo of the energy ministry said power should be restored by Sunday night or Monday. A worker at a Santiago hospital died when he slipped and hit his head.